The NBA is in big trouble for everybody. There are superteams forming everywhere and nothing will be able to stop that. Will the NBA continue to be a diverse sport? Or will it just be a game of who has the better team? The NBA is in trouble. The NBA is in big trouble. Throughout the history of this fascinating game, there has always been a villain. One that would soon be the face of the NBA. The one that will go through struggles that nobody else will go through. The showstopper. The person that will dominate the league. If you know anything about basketball, you know that there is always that one player that is spoken about more than the rest. Yes. It’s LeBron James. He has been the face of the league since Kobe Bryant became less efficient. LeBron is getting old and there is not somebody we can rely on that will be the face for the future. Now, I am not saying that Stephen Curry isn’t enough to be a villain, but he has a talent and it is not taken as if he goes around and plays as if he wants to destroy peoples’ hopes and dreams. Michael Jordan was a player that liked to trash-talk and show off his skills on the court. Kobe Bryant did the same thing. Great players have a way of communicating and letting people know that they were the real deal at that time. When Kobe Bryant first came into the league, Michael Jordan and Kobe Bryant had a fight between who was going to be the face of the NBA. Kobe Bryant took that. LeBron then came into the league when Kobe Bryant was just peaking at his career. The NBA is a well-organized sport but some things are a little biased. The NBA is in trouble right now, and with the 2017 Draft coming up, we better pray that somebody will step up to show us what they got. The NBA is in Trouble by Dominic Kock is licensed under a Creative Commons Attribution-NonCommercial-NoDerivatives 4.0 International License. I am very interested in your post about the NBA,”The NBA is in Trouble” because I am a big fan of the NBA. One sentence you wrote that stands out for me is: “If you know anything about basketball, you know that there is always that one player that is spoken about more than the rest. Yes. 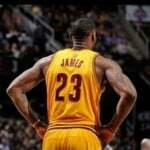 It’s LeBron James.” I think this is something we can all say its true because he is the best player in the NBA so far. Another sentence that got my attention was: “The NBA is in trouble right now, and with the 2017 Draft coming up, we better pray that somebody will step up to show us what they got.” This stood out for me because we do need someone else to give LeBron James some more competition since he has been dominating the NBA for a long time already. Thanks for your writing. I look forward to seeing what you write next, because this was an interesting topic for me. Dominic, I liked how you mentioned that with LeBron getting older, there needs to be a new villain in the NBA. I also agree with the fact that Steph Curry doesn’t have what it takes to be a villain, but possibly it could be Kevin Durant. However, I disagree with the fact that a villain needs to be in the NBA by next season, strictly because nobody has proven that they are better than LeBron James, even though he is old. Many people may want to talk about how LeBron couldn’t beat the Golden State Warriors in the NBA Finals, but the Golden State Warriors are an All-Star team and I wouldn’t have expected Michael Jordan, who also never beat a “superteam” in his entire career, to be able to beat a team like the Warriors when he was playing. I believe that the NBA has a couple years before they need to find a new villain. Dominic I found your article very intriguing. I too believe the NBA is in trouble, but for different reasons. I think there is no clear face of the NBA at this time, and so the NBA is struggling to find an identity. I do like you point to Stephen Curry not being to much of villain, and you are right, about a passing off the torch type deal. What made you intrigued about this topic. What type of player dos the NBA need right now. Overall great question, about a topic that affects all basketball fans. I am very intrigued by the sports article you wrote, being that i have a large interest in the NBA. I really enjoyed your views on the subject and the way that you chose to explain your feeling on how doomed the NBA is. One sentence that stood out to me was “Now, I am not saying that Stephen Curry isn’t enough to be a villain, but he has a talent and it is not taken as if he goes around and plays as if he wants to destroy peoples’ hopes and dreams.” I like this one because I have the same views on Steph Curry that you do and completely agree with you on this matter. Thanks for writing, I really enjoyed tjis and hope to see more writing from you soon.